Keep your answers brief and concise. Unless asked to give more details, limit your answers to 2 to 3 minutes per question. When answering questions include concrete, quantifiable examples. When discussing your strengths include measurable information and provide details about specific accomplishments. Repeat your key strengths during the interview. It s essential that you comfortably and confidently articulate your strengths. Explain how the strengths relate to the job role. Prepare five or more success stories. In preparing for interviews, make a list of your skills and accomplishment. Then reflect on past jobs and pick out one or two instances when you used those skills successfully. 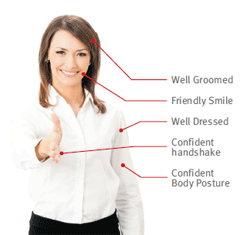 Use your body language is vital, make sure your nonverbal; gestures, physical appearance, and attire are highly influential during job interviews. Ask questions. The types of questions you ask and the way you ask them can make a tremendous makes an impression on the interviewer. Good questions require advance preparation. Just as you plan how you would answer an interviewer’s questions, write out any specific questions you want to ask, about the company or the job role. The interview process should be a two way dialog, whereby you and the interviewer assess each other to determine if there is an appropriate match. Maintain a conversational flow. By consciously maintaining a conversational flow, a dialogue instead of a monologue. You will be perceived more positively. Use feedback questions at the end of your answers to create conversational interchange between you and the interviewer. Research the company, service offering and competitors. Research will provide information to help you decide whether you re interested in the company and important data to refer to during the interview. Interviewers expect a candidate for employment to be able to review their work history in detail. Be prepared to tell the interviewer the names of the companies you worked for, your job title, your starting and ending dates of employment, how much you earned and what your job entailed. In managing a software development project, I coordinated the team and managed to get the projectback on track. We were able to successfully troubleshoot the issues and solve the problems, within a very short period of time. You may be asked the question What were your expectations of your job that you are currently working at? The best way to respond this question is explain your current expectation of your job and give examples of how the position worked out for you. Its okay to state if your expectation where not met. When answering questions don’t focus too much on the negative. Instead, address the highlights of the job. When you are asked questions related to your current or previous positions, it’s important to be specific and to be positive about what you did in your previous position(s). The best way to respond is to describe your responsibilities in detail and to connect them to the job you are interviewing for. Try to tie your responsibilities in with those listed in the job description for the new position. That way, the employer will see that you have the qualifications necessary to do the job. Focus most on your responsibilities that are directly related to the new job s requirements. When asked the question Where do you see yourself in 10 years? Its important to emphasis the reasons why you applying for the position and how you see yourself develop into the role More importantly you should remain true to yourself and explain what kind of work you would like to grow into. What is your reaction to the number of hours required to fulfil the job role? What do you need to do to make yourself a competitive candidate? Do you think you would like the job role and the company? What is your reaction to the conditions (stress/anxieties) of this occupation? Do you want to deal with them? Have any changes taken place in your opinion of the job role as a result of your interview? What are the most important lessons learnt you have acquired from the interview? What misconceptions of the job role did you correct?